Tattoos and copyright were in the social buzz again recently, with a piece published by Legalzoom, Before The Ink Dries: Copyright Law & Tattoos making the rounds. Unfortunately, the article did little to explain how copyright actually applies to tattoos and was even a little misleading in places. Tattoos have been the subject of a small number of copyright lawsuits, in which tattoo artists have claimed infringement when their tattoos were exhibited by: NBA player Rasheed Wallace in a Nike commercial; another actor wearing a fake Mike Tyson tattoo in The Hangover II; NFL player Ricky Williams on the covers of video games; and video game characters depicting martial artist Carlos Condit. All of these cases settled out of court, so we have no judicial interpretations of how copyright applies to tattoos. Most of us aren’t celebrities, so from a practical perspective, may never have to worry about being sued over displaying our tattoos, but with the spread of reality TV, who knows? I have two tattoos: a beautifully crafted starfish and the two-word phrase “it’s incredible…” (from Nat King Cole’s “Unforgettable”) written in lovely script. If one day I replace Judge Judy, or tell my story on a “house rescue” show, should I be careful to not reveal my tattoos? 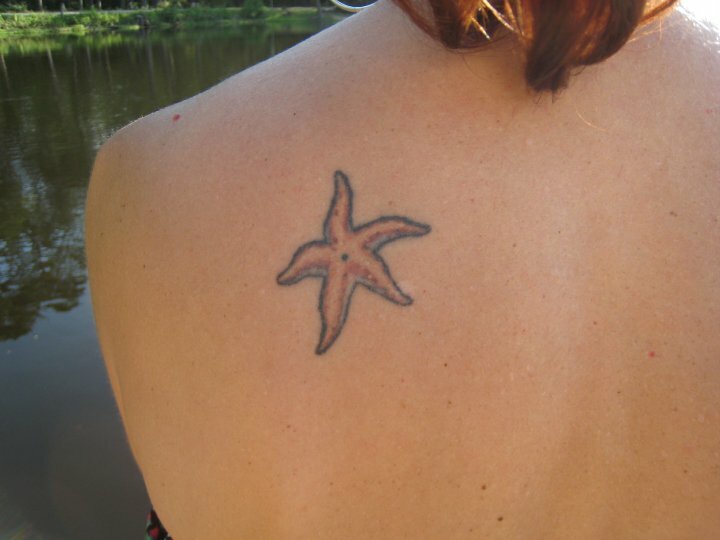 Are tattoos protectable by copyright? If the image contains a modicum of creativity, and assuming it is not in the public domain (e.g., the Mona Lisa), then yes. Current U.S. copyright law automatically provides copyright protection to original works of authorship fixed in a tangible medium of expression. “Tangible medium of expression” is not defined in the Copyright Act, but that phrase is modified by “from which [the works] can be perceived, reproduced, or otherwise communicated.” An “original work of authorship” is one to which the author contributed at least “a modicum” of creativity; this is a low standard that basically means the author must have actually created something. My skin is certainly tangible, and others can easily perceive and even reproduce my tattoos. 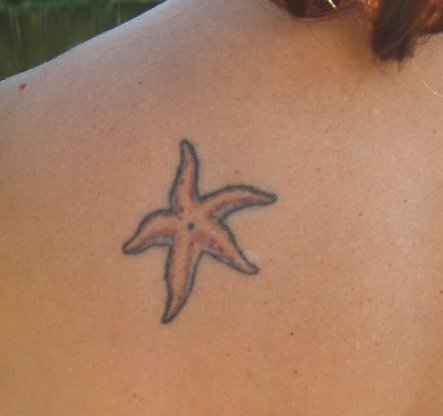 The design for my starfish tattoo clearly contains a modicum (or more) of creativity; I visited three tattoo artists before finding one who could sketch what I wanted. However, neither the two-word phrase nor the scripted format of my second tattoo meet the creativity requirement. So one of my tattoos is protected by copyright, and the other is not. In my case, this is an easy question to answer; I have no artistic skills whatsoever, so I contributed nothing to the design of my tattoo beyond the unprotectable idea. The artist, Sean, created the image himself, so he owns the copyright. But many situations are more complicated. It is not unusual for someone to bring her own design to a tattoo artist, or for the client and the artist to collaborate on the design. In such cases, they may be considered joint authors with equal rights in the work. If the artist owns the copyright, what rights do I have in “my” tattoo? This question probably explains why the public is so fascinated by a copyright matter: The concept of having a design permanently embedded in your body but in which the legal rights belong to someone else is… well, it’s just weird! Despite owning the copyright in my starfish tattoo, Sean’s rights are actually pretty limited by the doctrine of implied license. An implied license may be found when, in the absence of a written agreement, a court looks to the conduct of the parties in attempting to determine their intent. A tattoo artist provides his or her services knowing that the client is likely to exhibit the tattoo during the course of living a normal life, which includes activities like sharing photographs and video clips of themselves on Facebook or Instagram. When an artist tattoos a celebrity, he knows the celebrity, tats and all, is likely to appear in various types of media; such activities will fall under an implied license. Activities outside of the scope of the implied license are those that were not intended by the parties when entering into their transaction. For example, my implied license certainly does not grant me the right to tell a different tattoo artist she can use Sean’s design, or to sell photographs of only the tattoo on Etsy as wall art. Similarly, publicizing a movie by using an image of a celebrity’s tattoo standing alone, rather than an image of the celebrity himself, could fall beyond the scope of implied license. I expect to become famous; what should I do? Rely on the standard legal fallback: Get it in writing! Anyone—tattoo artist or inked client—concerned about such issues should just nip any trouble in the bud by signing an agreement before bringing the needles out that clearly states each party’s rights.